In Jazz in American Culture, Burton W. Peretti writes: "Recordings of [Lennie] Tristano's 1949 sextet, featuring the tenor saxophonist Lee Konitz, presented improvisations with no established chord changes and little sense of swing—only the gradual, fuguelike introduction of voices in a dispassionate and dissonant kind of polyphony." Sounds like some contemporary classical music; as Alex Ross said the other night at the Fitzgerald, sometimes there's not a lot of difference between music that has been assigned to different categories. But it was the year of the sextet that struck me: 1949. 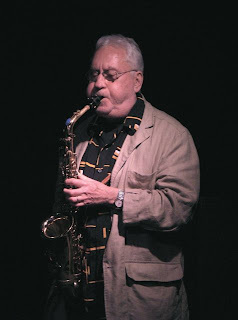 We saw Lee Konitz at the Artists' Quarter earlier this year (when this photo was taken), and he did not blow or behave like someone who's been doing this for so many years. In fact, when a woman stood up and started taking flash photos, there was a moment when many of us thought he would tear her from limb to limb and throw the pieces up the stairs and out the door onto the 7th Place Pedestrian Mall. Fabulous young saxophonist Grace Kelly is studying with Konitz and she's a lucky girl. Local writer, editor, and jazz fan John Toren wrote about Konitz (and Hiromi) for his online publication Macaroni, and I like what he had to say.